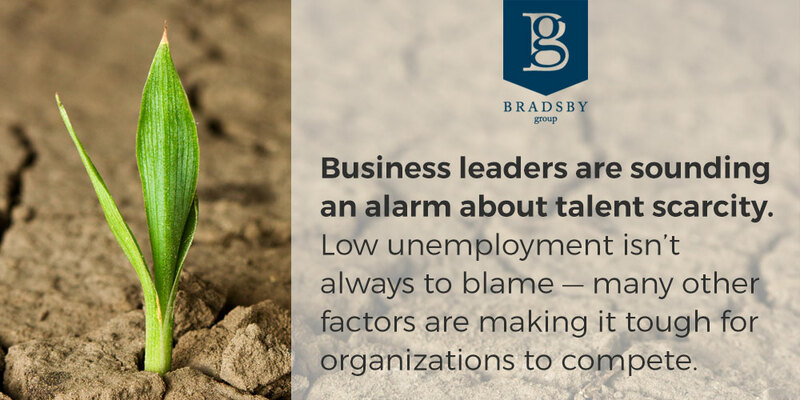 Bradsby | Employers want to know: How will talent scarcity affect my business? Employers want to know: How will talent scarcity affect my business? Business leaders are sounding an alarm about talent scarcity. Finding people with the skills their organizations need has become increasingly challenging. Talent scarcity isn’t a problem of too few people, clarifies Steve White, leader of PwC’s Global Mobility Strategy Consulting team. Rather, “it’s about having enough of the right skills in the right places at the right cost,” he says. In a recent survey of global CEOs done by PwC, “more than 72 percent told us talent was their number one threat to growth. It is the most critical issue facing their business,” White states. Everyone understands that the unemployment rate is at historic lows, which contributes to the problem. But that’s not all. White cites demographics, for one thing. Baby Boomers are starting to leave the workforce. Yes, many of them are deciding to work longer, but even then they want to work on their own terms. And their cohort is large enough that, as they retire, they leave a vacuum of talent. Millennials, the second “boom,” if you will, have now passed Boomers in numbers in the workforce. They are developing their skills, but they can’t be ready immediately to fill all the gaps left as the Boomers depart. Gen X’ers’ talent should not be underestimated; there just aren’t enough of them to make up the slack. Just as importantly, the speed of change and increase in complexity continues to accelerate, which requires a more fluid mindset for both management and employees to remain relevant. White urges organizations to begin immediately to plan strategies to meet these talent shortfalls. Shift your thinking about talent. “Stop looking to fill specific jobs with specific technical skill sets and start building pools of talent that are adaptable and flexible, agile, mobile or capable of being mobile, and able to think critically and creatively,” he says. Value social responsibility. “Workers of today and tomorrow place an incredibly high value on working for companies that share and exhibit values and beliefs similar to their own,” says White. If you haven’t already, define and plainly state genuine corporate values that show how you want your organization to be a positive force locally or globally. Then give your employees opportunities to participate in meaningful ways. Develop talent internally. When possible, align your talent needs to individual career goals of current employees. Investing in staff development can do for you what the minor leagues do for the majors in baseball. Plus, it will increase retention because of job satisfaction and create a draw for new hires. Work with a skilled recruiter who understands changing talent needs. In light of the challenge of talent scarcity, re-evaluating your recruitment strategy would be wise. Bradsby Group can help you redefine who your ideal candidates will be to meet your present and future hiring needs. Then we will search out talented individuals who will help you advance toward your business goals. Don’t let the lack of talent be a barrier to your innovation and success. Call our team today.